When your dermatology health is concerned, solutions vary. To sum up everything besides the main dermatology services we provide, you maybe interested in some of our additional treatments. Just keep in mind, that there may be plenty of miscellaneous ways to approach your specific skin health. We individualize treatment and care plans based on each individual patient need.We look forward to working with you to achieve the very best health outcomes. Georgia Skin & Cancer Clinic provides a full range of general and cosmetic dermatological services so you can enjoy the healthy skin you deserve. 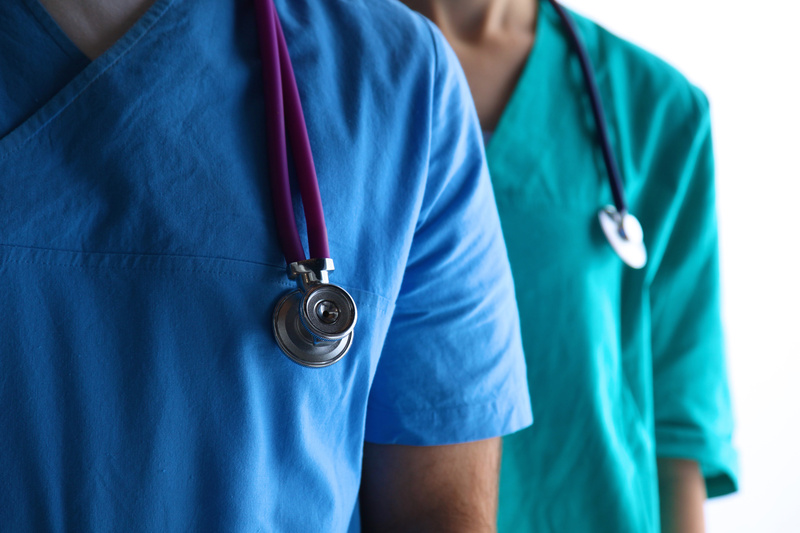 We carefully plan individualized treatment and care plans for our patients. Georgia Skin & Cancer Clinic offers the most up- to- date treatments with proven efficacy. Contact our team to discuss potential treatment options: 1-800-599-0067 Not all patients are alike just as all diagnosis may differ in the effectiveness of treatment outcomes. 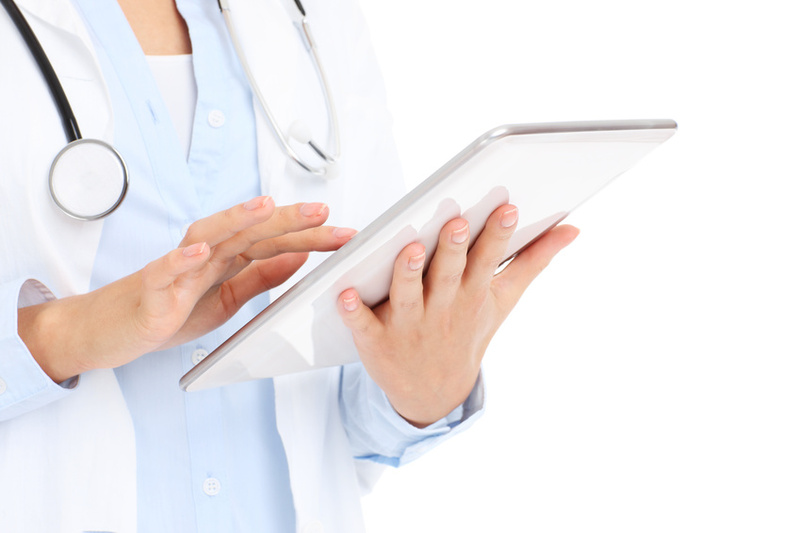 We believe in personalizing each patients treatment plan to ensure the very best outcomes. Patch testing is a common diagnostic tool used to identify the specific agent that triggers contact dermatitis, an itchy rash that can breakout on your skin in response to a substance to which you are allergic. Common trigger substances include jewelry, hair care products, cleaning solutions, detergent, cosmetics, perfumes, and latex rubber. 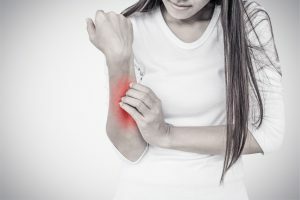 Burning The best protection against contact dermatitis is to identify the specific triggers that cause reactions, so that patients can avoid these substances as often as possible. A patch test may help identify the trigger. It does not require the use of any needles or injections. WHICH PATCH TEST IS USED AT GEORGIA SKIN & CANCER CLINIC? Most dermatologists use the TRUE Test, which is a very good screening tool but is limited to testing 28 chemicals. At Georgia Skin & Cancer Clinic we offer an expanded patch testing for what is called the North American Series of Allergens, which include up to 80 allergens known to cause skin rashes in North America. The patch testing procedure is simple and painless. 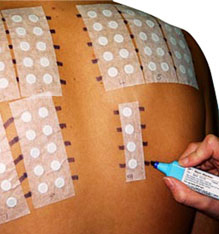 In order to identify specific triggers, we will tape several patches that contain various potential chemicals to the skin on the back. These chemicals are then left on the skin for 48 hours, and must remain dry during this time. Patients are advised to take only sponge baths and avoid excessive sweating. After 48 hours, the patch test is removed and an initial reading is taken to observe any reactions. An additional reading is taken after another 24-48 hours. Patients can bathe in between these readings, but should avoid scrubbing the back. Once the final results of the test have been read, normal bathing can be resumed. A typical schedule for testing is to come in on Monday (to apply patches), Wednesday (to remove patches) and Friday (to read results). Before undergoing patch testing, patients should stop using oral and topical corticosteroids in the area to be tested, avoid oral antihistamines, and should not expose the test area to the sun for at least three weeks. WHAT HAPPENS IF THE TEST RESULTS ARE POSITIVE? When reading the results, we will classify each spot on a scale from negative (meaning no reaction) to extreme reaction (meaning positive results for substance). Strong results may cause blisters or ulcers on the skin, which can be treated once the test is complete. Once positive results have been determined, patients can take steps to avoid their triggers and prevent contact dermatitis from occurring. Our office will provide you with specific information on your individual triggers and how to prevent contact. Since we are involved with the American Contact Dermatitis Society, we have access to a database allowing us to provide a comprehensive list of products a patient may use based on their individual test results. Accutane is one of the trade names for the drug Isotretinoin. Isotretinoin is a retinoid, derived from vitamin A, and is a very powerful drug for the treatment of severe acne. Accutane can control acne for months or years after the end of the treatment. Four to five months of Isotretinoin treatment at the correct dose can lead to clearing of acne for one or more years (or even permanently) after medication is stopped. Other acne-controlling medicines are only effective while they are being taken. Isotretinoin can have significant side effects when taken so it is prescribed under strict guidelines. The most damaging side effect of Accutane is serious birth defects if taken during pregnancy. Therefore, it is extremely important for women not to take Accutane while pregnant, and not to become pregnant while using it. Women who are of child bearing ability must use two effective methods of birth control (pills, IUD, etc). Accutane may also temporarily increase blood fats to risky levels. Occasionally it may temporarily raise liver enzymes. These both normalize with lowering of the dose or stopping the medication altogether. This is why a baseline blood chemistry test is established before patients start taking Accutane and is repeated after one monthly during treatment. of medication.These blood tests must be done after you have fasted for 12 hours (no breakfast), so that the blood fat determinations are reliable. Georgia Skin & Cancer Clinic will prescribe Accutane when other acne treatments have failed, in very severe cases of acne, or when someone is not responsive to traditional therapy. Either full dose or low dose Accutane can be prescribed. Full dose has the potential to cure acne whereas low dose will control acne but cannot cure it. Low dose Accutane can be taken for a longer period of time. Because of the serious side effects associated with Accutane, different countries have their own restrictions on the dispensing of isotretinoin. In the U.S. isotretinoin prescriptions are controlled by the iPLEDGE website. 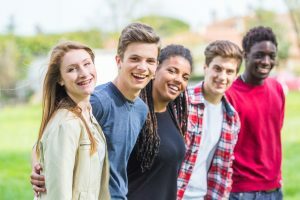 Dermatologists must register patients with this site before prescribing Accutane and pharmacists must check the site before providing Accutane. A patient cannot be prescribed more than a 30-day supply of Accutane at one time. After an Accutane prescription has been written, the patient has 7 days to pick-up the medication. If this 7 day window is missed, the patient must start the process over. Accutane decreases the amount of oil produced by the skin’s sebaceous (oil) glands. It may be as long as two months before you see improvement in your skin. In fact, sometimes acne gets worse during the first month or so of treatment. There is a medicine we can temporarily add to control this if needed. What are the long-term results of Accutane treatment? Your skin may stay clear for months, even years, after Accutane is stopped. If your acne returns, it may be necessary to prescribe oral antibiotics, Accutane again, or just topical acne therapy, if the acne is mild. How does my diet need to change while I am on Accutane? Because Isotretinoin is itself a form of Vitamin A, no multivitamins containing Vitamin A should be ingested during the course of Isotretinoin treatment or in the six months immediately following treatment. (Vitamin A is a fat-soluble vitamin that is stored in the body, so consuming high levels of the vitamin will magnify the possible side effects). Avoid foods rich in Vitamin A, especially orange or red fruits and vegetables (carrots, oranges, tomatoes, etc.) and green vegetables (broccoli, spinach, etc.). Liver (including pate) is also very rich in vitamin A and should be avoided. Pale fruits and vegetables (pears, apples, iceberg lettuce, etc.) may be eaten. Cryotherapy is a safe, effective treatment used for many common skin conditions such as warts or actinic keratosis. On occasion, dermatologists prefer cryotherapy for the treatment of basal cell carcinomas and squamous cell carcinomas. 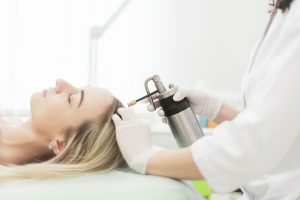 Your dermatology healthcare professional will apply liquid nitrogen – a “frozen liquid “ – using a special applicator with a cotton tip or spray nozzle. The liquid nitrogen is sprayed/place against the affected area for a few seconds, depending on the size and diagnosis of the lesion. In some cases, this procedure will be needed more than once. Cryotherapy usually is not painful and the patient may feel only a slight stinging sensation, which can increase should the chemical touch the surrounding healthy skin. Some redness or swelling may occur following cryotherapy treatment. Cryotherapy creates a blister, which evolves to a scab. Once the scab falls off, new, healthy skin is revealed. Minor scarring is possible in some cases. If you have raised seborrheic keratoses (SKs), you may be looking for a solution that can remove these blemishes so you can enjoy clearer skin. Good news: Eskata is that solution! This FDA-approved procedure uses a strong hydrogen peroxide solution to remove the raised SK. With just two treatments, patients should see significant clearing of raised SKs. At first glance, Eskata looks like a felt-tip pen. But this pen contains a 40% hydrogen peroxide solution, which is essential for minimizing the appearance of raised SKs. During your treatment – which takes less than 30 minutes to perform – your dermatologist will apply the felt-tip applicator to your raised SKs. You may feel a slight tingling sensation, which is a sign that the hydrogen peroxide solution is going to work. Once your procedure is done, you will get instructions on how to take care of your treated SKs in the coming week. You’re a good candidate for Eskata treatments if you have raised and/or shiny skin marks that look like light moles, pimples, or freckles. While raised SKs aren’t dangerous, they can make people feel self-conscious about their appearance. Please note that Eskata cannot be used to treat raised SKs around the eyes, or open and/or infected SKs. There’s no downtime or recovery associated with Eskata, so you can continue with your normal routine after a treatment. We’ll provide you with specific instructions on how to care for your treated SKs within the first week after treatment. Results can vary, depending on the size and/or number of SKs being treated. About 25% of patients can expect to see 75%+ clearance of SKs within three months.